The soldering stations are located in the downstairs Electronics Lab of the OEDK and features a microscope, heated tweezers, soldering station, solder, flux, fine tipped soldering irons, and 2-propanol for cleanup. This station is specially designed to help with the soldering of circuit boards. Ask OEDK Technicians for assistance. The T-Tech Quick Circuit QCJ5 circuit board printer is a machine capable of milling custom printed circuit boards (PCBs). It will take a sheet with a layer of copper on top and on the bottom and cut the traces. It is ideal for quick and inexpensive prototyping of circuit boards. It is located in the downstairs Electronics Lab of the OEDK. 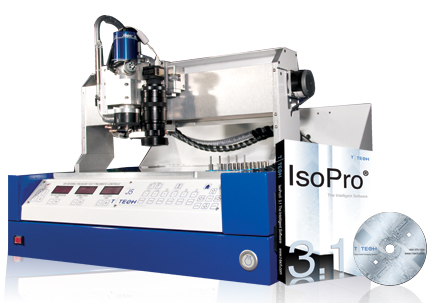 To print using this milling machine, you will need to create a gerber file from a circuit board plotting program. You can find these tools on campus (Orcad), or you can download free programs for academic use - Eagle is one example. Eagle is installed on the OEDK computers. After you have created the gerber files, you need to save them to a flash drive and use them at the PCB mill to create your circuit board. OEDK Lab Technicians can guide you in the proper use of the PCB mill. 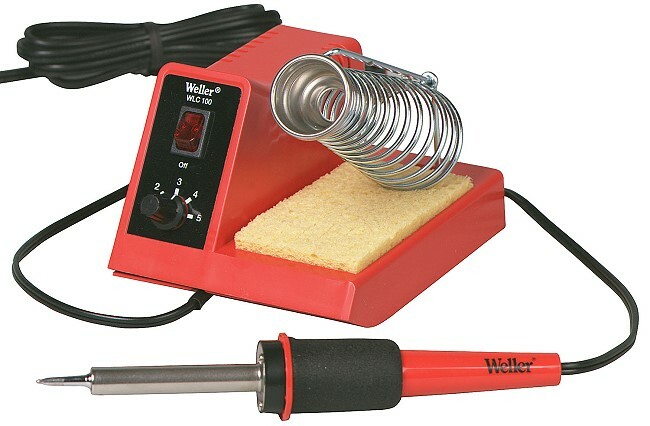 After you have created the PCB, you can then solder in the components at the soldering station. Package type: A component is packaged a certain way to be soldered into a circuit board. This is called the package. There are many different types: DIP(dual inline package) is what you will have seen in most of your labs for integrated circuits, SOIC (small-outline integrated circuit) is a smaller surface mount package, etc. You can find a guide here. Integration with the rest of your components: If you will be connecting your PCB to other components, it is recommended that you spend a great deal of time planning how you will connect the PCB to those components. There are connectors designed specifically for this purpose. The effort you put into the initial design will save you a lot of headache later. Think about the inputs and outputs for your circuit, and ask Carlos Amaro about your design before you mill it or have it sent off for milling. The OEDK PCB milling machine does not however make through holes in the PCB, and if you require a very fine circuit board, you may want to use an outside vendor. This is a preferred vendor for many OEDK students. They offer an instant pricing tool to help you find the best price/lead-time combination for your specific project. You can find the pricing tables HERE. Their lowest price service is $95 for a batch of two boards of up to 9 square inches, with 24 hr turn around. These are double sided boards with no silkscreen or solder mask. They have a $33 each special for two layer boards up to 60 square inches, with solder mask and silk screen. The lead time is five days. The minimum quantity is normally four, but this is waived if you are a student. You can get 3 3.8 x 2.5 inch boards for $51. These are also double sided, no silkscreen, no solder mask, 1 day turnaround. To use this service, you must use their (free) proprietary software. They do not accept Gerber files. 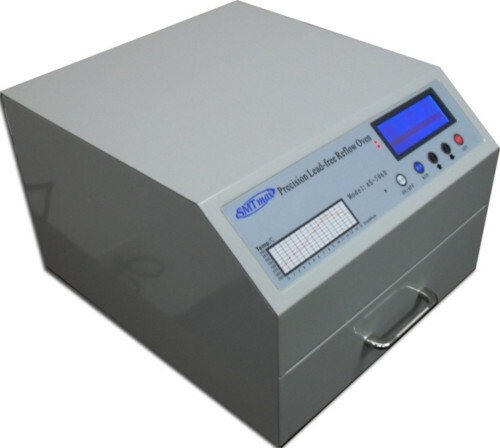 The AS-5060 IR Lead Free Reflow Oven is equipment that used for electron production and maintain of SMT technique. The product adopts the far-infrared heating components and excellent sense temperature materials. Through the precise control of the microcomputer, make the temperature control curve match to the request of the SMT production technique completely. The "temperature control curve" of the equipment can be adjusted accurately, so it can satisfy the request of many kinds of soldering paste which are different material parameters. It can shut down and alarm the faults automatically. Also it has many functions, such as soldering, maintenance and drying. The structural performance and operation has been upgraded and improved. Using Chinese-English bilingual operating system and efficient and convenient power switch. An extensive closet of National Instruments data acquisition equipment and software is available to teams. Visit the OEDK's NI closet or the NI Page to see what is available, or an OEDK Technician for assistance. To use the NI equipment, you must check it out through an OEDK staff member. A collection of various Texas Instruments surface mount electronics components is available to teams. Containers of the components are held in the electronics lab. Visit the lab or the TI Page to see what is available, or an OEDK Technician for assistance.